Dear Bob and friends at MIRA, Thank you for my dog Quenouille. He has changed my life by allowing me to walk to school. He helps me travel more confidently. Also when I cross the street I know that I am crossing straight because he keeps me that way; before I kind of got nervous. He also helps me feel better when I am walking though the crowded halls at school and lunch time. I can now walk without bumping in to objects and people. Everybody at school enjoys watching him and he’s very popular. Now at school people are inspired by how service dogs do their jobs. I also enjoy running around the block with him. He also adds a lot of joy and assurance to my life. He also brought freedom to my life by being able to walk to my friends house just with him and having some freedom like a regular kid. I enjoy him because he is such a good dog when he is working. He has come with me to some unusual events and behaved very well. He even flew on an airplane with me when I when to Florida for a Goalball tournament. Quenouille also did well when he met other guide dogs. He did not interact with other guide dogs. Some other dogs bit each other and did businesses in public places. But he did do any of that, and I was proud of how well he behaved. He is a super guide dog! I’m Darcie and I am a senior in high school. I lost my vision at age five and spent most of my life using a cane to help me get around. The cane helps but it also hinders. People are hesitant to approach someone with a cane and that is definitely true for other students when one gets to junior high school. 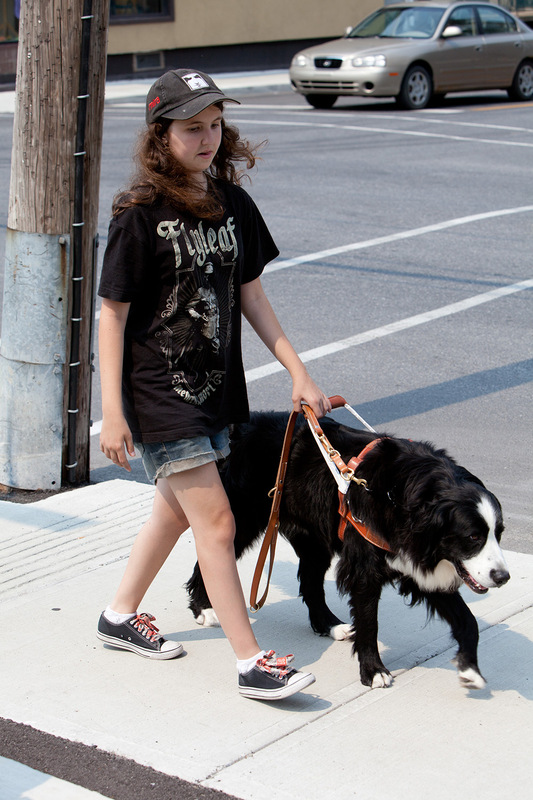 Blindness doesn’t exactly enable one to be part of a teen group. It is lonely. 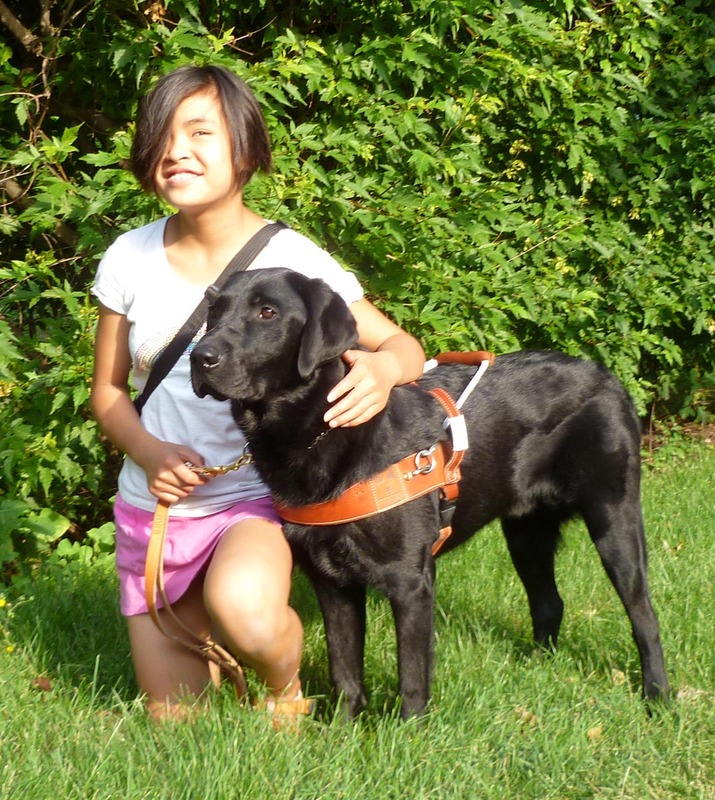 Just before I started high school, I applied to MIRA for a guide dog and I was accepted and trained in Canada for a month with my new guide dog, Navy. I can’t imagine my life without him now. Navy has enabled me to be my own person. He gives me so much confidence and life is so much better with him. With Navy, people are more likely to come up and talk with me, even at first if it is to ask questions about him. He brings contact with others, especially teenagers, that I did not have before. Having a guide dog opens so many doors, not only enabling more contact with people but in giving a sense of independence to me so that I feel confident and able to do things on my own. I love to write and I have finished a young adult novel that I hope to have published. I have had so many interesting experiences and love to talk about them in person and in print. As for Navy, it is very important to me to have gotten him at an early age. It gives us the opportunity to bond well together and I really do have more independence. Having Navy gives me a chance to dream of life when I go to college and beyond. Life with Navy is truly a team effort and I trust him totally. He is my door opener in many ways but mostly to a new and independent life.